We often hear stories about the financial difficulties of the artists of the previous generation, the generation of black and white films and their urgent need for money after the spotlights dimmed, after they stepped away from acting and singing. Some of them even requested the Sadat pension which was less than 100 pounds, in order to make ends meet. [Translator's note: The Sadat Pension was a decision by President Sadat designed to give financial assistance to the elderly who had no income.] The falling of some artists into this situation raised several questions about the lack of solidarity and support from younger artists. The artist Samer Sabry, known for his love and continued quest to help the older generation of the art world, answered these questions on the program Saaet Safa hosted by the artist Safa About el Se3oud on the television channel Art Aflam 2. He confirmed that he found out that Samia was going through financial difficulties after her divorce from actor Rushdie Abaza, resulting in her inability to provide for herself and her family consisting of her sister and her sister's five children. He suggested to her that she do a raqs sharqi show segment with him [in his show]. This was when she was in her 60's in 1985, in a hotel, for the amount of 2,000 pounds. This segment successfully attracted many Egyptians and Arabs. Sabry also explained that he called the artist Abdel Aziz Mahmoud to participate with them in these segments for 300 pounds, even though he had earned 1,000 Egyptian pounds per party in 1948, and he agreed immediately because he needed the money. It was the same with the artist Ragaa Abdou who had acted alongside Mohamed Abdul Wahab and had performed a duet with him, and it was the same with artist Soad Mekawy as well. 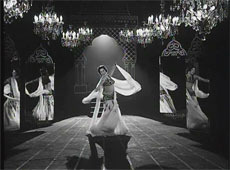 ABOUT THE PHOTO: This is a still from a dance scene in Samia Gamal's 1955 motion picture, Sigarah wa Kas (A Glass and a Cigarette). Regarding his show troupe, Sabry explained that he was the first to hire Russian dancers and he was slammed for that and for leaving out Egyptian dancers. He stated that he was forced to do this out of despair at the ambition of the Egyptian dancers and the desire they all had to become Farida Fahmy or Taheya Carioca. In addition to this they did little exercise and ate a lot in comparison to the Russians. Dina started out as a sha'abi dancer in his troupe and he liked her dancing. In those days she was a college student, but she accepted an offer from the hotel where they worked to perform as a solo raqs sharqi dancer so she left his troupe. Regarding Mr. Sabry's love of singing and performing, he explained saying that his father was the secretary of the Army Officer's Club in Zamalek and was the one responsible for organizing parties so he grew up hearing the music and attending the concerts of top artists such as Oum Kulthoum and Mohamed Abdel Wahab. He also went to the cinema with his family, as it was the entertainment of the Egyptian family. About his distinguished performances in foreign languages, he said learned English from his studies at a foreign school. He translated the films he saw at the cinema into English and that helped him to improve his language skills. But the secret to his learning the Italian language was that it was the language of the daughter of a neighbor and he learned it so that he could talk to her. ABOUT THE PHOTO: This is Dina. These follow-up comments were made by an Egyptian who remembers when this show was advertised and people were talking about it. Yes I remember those days of the shows of Samer and Samia together. It was in a hotel, either the Sheraton or Movenpick, I can't remember which one. I remember there were many advertisements and news stories about this event, and I remember people had different views about this event before the show opened. But I remember too that after this show opened and people saw it, most people liked it and began to say, "This is the real beautiful dance." As Samer said in the article, the show successfully attracted Egyptians and Arabs to go to this hotel and watch it. Advertisements about it appeared in the newspapers and magazines in those times, and people be gain to ask each other, "Did you go to see Samia dancing?" She danced many times, not just once. The show in fact ran for months, but I can't remember exactly how long. About Samer Troupe, I saw them live in a wedding reception of one of my friends. I remember it was in Movenpick Hotel and they hired Samer Troupe to perform in this party. His troupe had men and women. He sang and they performed around and behind him. The men I remember were all Egyptians. The female dancers, as Samer said in the interview, were mainly Russians, but there were also some Egyptian women in his troupe. In fact, when he performed with the dancers behind him, the Russians appeared more perfect. I mean that when they danced the show choreography and not belly dance, the Russians danced with more precision than the Egyptians, doing the same movements perfectly together at the same time. But when Samer let them to begin to dance raqs sharqi in between the guests that were at the party and in between tables, asa well as on the tables, every dancer on a table, the Egyptians were dancing the raqs sharqi more perfectly. Samer Troupe was famous. Many people hired him to entertain at their wedding celebrations. It was well known that bringing Samer Saber Troupe to a wedding reception will make everyone happy, make them dance, and put them in a very good mood. "Samia Gamal Danced with Me in Her 60's". Translated by Priscilla Adum. Historic Photos of Samia Gamal. Photos of Samia collected by Priscilla. Isaac Dickson: Dance Instructor to the Stars. By Priscilla Adum. 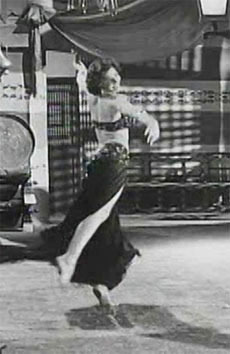 Samia Gamal: Biographical Profile from Dahsha. Translated by Priscilla Adum. Samia Gamal Models Spring Fashions. Translated by Priscilla Adum. Samia Gamal Talks About Farid al-Atrache in an Interview. Translated by Priscilla Adum. Placed online July 30, 2018. Spencer Tracy and Rhonda Fleming at the Iftar Table. Memoir written by Samia Gamal, translated by Priscilla Adum. Samia Gamal Interviewed by Fouad Moawad in 1968. Translated by Priscilla Adum. Tahia Carioca Interviewed by Mona Gaabr and Samia Gamal Interviewed by Tarik Habib. Translated by Mahmoud Sami.